Immediately after seeing Sparkle Theatricals' original new work The Room with Closets, I posted on my Insta story: "I'm not sure what just happened, but it was exquisite. I feel like I was in a dream." This is one of those theater experiences that is so mesmerizing, that so fully and specifically creates a world through words, movement, music, and visuals, that it absolutely casts a spell over the audience. A spell that's hard to shake when you step out of the theater and back into harsh reality, like waking up from a dream that you don't fully understand but that created such lovely feelings you want to go back to it. It's also the kind of show that's really hard to describe; words fail. I'll do my best, but I encourage you to go see it for yourself. It's a beautifully unique piece, and the creators (theatrical director Jon Ferguson, choreographer Alejandra Iannone, technical director Rick Ausland, and this beautiful six-person ensemble) obviously put a lot of thought and care into every detail. See it at the gorgeous Southern Theater (a space that enhances every performance there) through this week only! 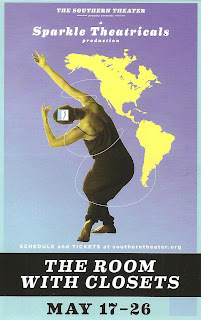 The Room with Closets is based on a collection of short stories by Argentinian American writer A. Pablo Iannone (who also happens to be the father of Alejandra). The piece presents 12 of these stories, listed in the program, as vignettes that are like puzzle pieces that together form the overall picture. Recurrent themes throughout the stories are passports, immigration, home, and identity, with a long discussion of Schrödinger's Cat. 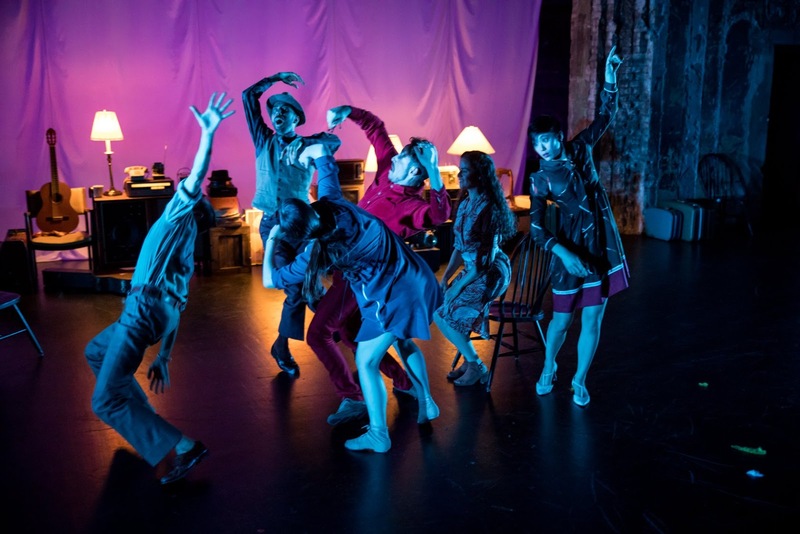 The stories are told through words, physical theater movement, dance, and music (both instrumental and vocal). It isn't important that you understand exactly what's happening, this isn't a plot-driven story, but just take in the images and stories and emotions created in the 75 spell-binding minutes. 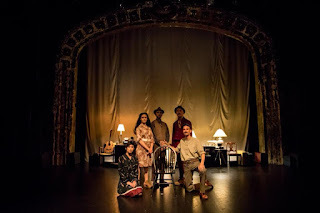 The Room with Closets reminded me very much of director Jon Ferguson's other work, particularly Nature Crown, presented in the Guthrie Studio a few years ago. Specifically in the way that multiple art forms combine to tell a story in a way that's difficult to describe, utilizing all of the diverse talents of the ensemble, and evoking a wide range of emotions. The six actor-dancer-musician-artists that make up the ensemble (Alex Barreto Hathaway, Helen Hatch, Joann Oudekerk, Kalen Rainbow Keir, Oliver Adam, and Stephanie Ruas) are all interesting to watch and work very well together as a whole, creating the world of the story. The Southern Theater is like another character, another artist, in the story. Beautiful images are created under that historic arch which provides such a sense of age and mystery. The arch itself is curtained off, with old suitcases, lamps, tables, furniture, and other odds and ends piled up in front of it. Props include chicken feathers, blood, flour, and many many passports (that sometimes fly like birds). I'm afraid I've done a really poor job of describing what The Room with Closets is. Just know that it truly was one of the most unique, lovely, and mesmerizing theater experiences I've had this year. Watch the video below for a glimpse of the creation process, and then head to the Southern Theater this week (click here for more info and tickets).